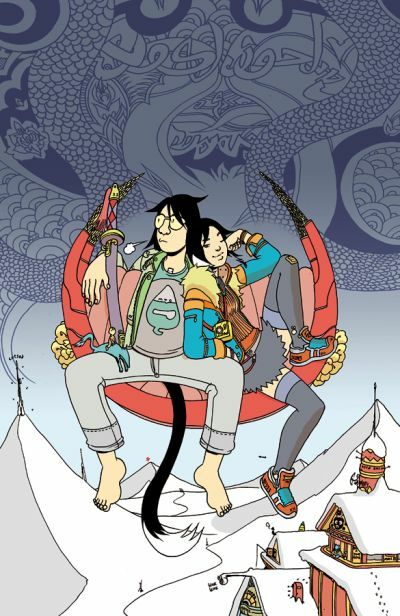 Brandon Graham has been called “one of the great talents to emerge in the last ten years” by Warren Ellis. His stark, imaginative reboot of Rob Liefeld’s PROPHET has garnered praise from all corners of the comic book world. PROPHET is drawn by a rotating cast of artists, but Graham got his start in comics drawing his own comic, the massive, pun-heavy KING CITY. Graham has returned to both the writing desk and the drawing table with MULTIPLE WARHEADS, a miniseries to be published by Image Comics in October. Just as rife with wordplay and wild with futuristic details (Vat-grown radiation-sniffing squids! Self-heating root vegetables! Musical caffeine cigarettes! Organic, mobile palaces!) as the reader-beloved KING CITY, MULTIPLE WARHEADS is a project where Graham has let his mind wander the open road. At the same time, he keeps the lives of his characters, grounded with familiar sentiments and actions. Graham talked about MULTIPLE WARHEADS with Comic Book Resources in an August 1 interview. The first issue of MULTIPLE WARHEADS, a four-issue, full-color mini-series, is 48 pages long. It will be available for in the August issue of Previews.